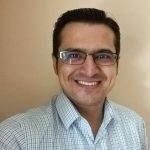 How can parents help in the development of a 2-month-old? Your baby has come a long way since his first cry. Your two-month-old now pays attention to faces, turns head towards a sound, and for the first time smile at familiar faces. There is even a substantial gain in physical growth. But, that is not all. There is so much more a 2-month-old baby can do. MomJunction gives you a detailed insight, along with a few red flags you must look out for. A baby displays progress in three areas of development namely cognitive, physical, and social and emotional. Each category presents its unique set of skill achievement. These milestones are about a two-month-old’s brain development, cognitive functions, and cognitive prowess. Pays attention to faces: Gone are the days when the baby would look at faces as if seeing through a haze. A two-month-old intently looks at someone’s face and maintains steady eye contact especially with primary caretakers such as parents. Can locate sound source: A better coordination of hearing and brain functions brings the ability to locate the source of the sound. The two-month-old turns his head around, searching for the sound source, for instance, the location of a moving rattle or a talking person (1). Has different crying tones: The baby cries when hungry differ from those when he just soiled. The baby’s mind is capable of prompting different vocalizations to convey distinct feelings (2). 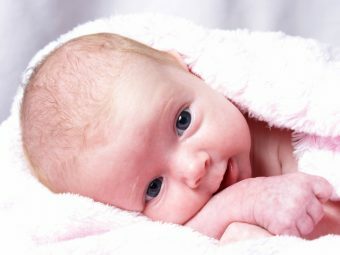 Recognizes people at distance: Memory and recall grow in leaps and the baby is quite capable of recognizing familiar faces even at a distance. These landmarks show a baby’s physical growth and muscular abilities. Head stays straight when held in sitting position: The head no more falls backward when the infant is held in sitting position. Neck muscles in a two-month-old baby are stronger, which means he keeps his head straight while sitting with support. Lifts head nearly 45 degrees when on tummy: Stronger neck muscles help the baby raise his head against gravity when he is placed on the stomach. At the age of two months, a baby can raise the head up by 45 degrees during tummy time. Partially pushes up when on tummy: The infant presses on the elbows and tries pushing up the body upwards from the tummy. Stronger shoulder muscles and joints help achieve this ability. Follows moving objects with eyes: Swing around an object in front of the baby from side to side, and the little one will have his eyes fixed on it. A two-month-old baby can track objects moving in an arc with a coordinated movement of eyes and neck (3). Better control on limb muscles: The baby now makes less jerky and smoother movements with limbs. It is due to a substantial improvement in the motor skills that helps in better voluntary muscle control. Some newborn reflexes disappear: The development of more rhythmic muscle control diminishes innate neonatal reflexes. For instance, the palmar grasp reflex fades at the age of two months as the infant learns to spend time with an unclenched fist (4). Improved vision and eye coordination: The baby pays attention to face details and discerns color better. The coordination between the muscles of both eyes improves, and the baby soon tracks slow-moving objects in close range. Listens to voices and high-pitched sounds: Babies at two months love hearing voices of parents and respond by looking in the direction of the sound’s source. 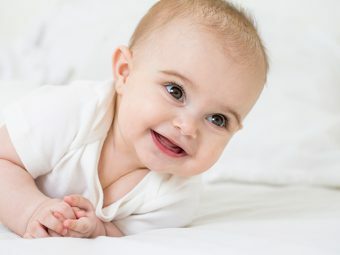 The baby will also react to high-pitch sounds such as singing and music, indicating a significant improvement in hearing skills since birth (5). This category presents milestones that define social skills and progress in emotional temperament. 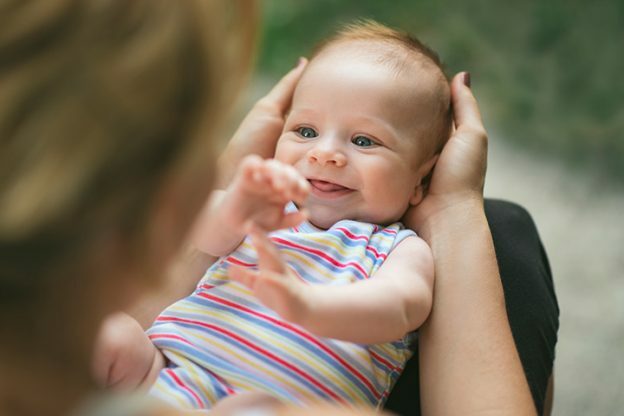 Smiles at people: Smiling is the most significant social milestone of infancy, and you see it first at the age of two months. The baby responds to a smile with a smile, especially to that of the parents. Responds to questions with coos and gurgles: When you speak to the baby, he will respond with coos and gurgles, as if trying to talk back. These sounds are incoherent and meaningless but are the foundation for meaningful conversations later in life. Can calm oneself briefly: The baby will try to self-soothe during crying bouts by bringing his hands to the mouth and sucking his thumb. It is an ingrained soothing method in stressful situations. Grumbles and acts fussy when bored: For the first time, the baby begins to display boredom and will cry fussily while growing disinterested in an activity or toy at hand. Fussiness is a significant hallmark of the baby’s behavior at the age of two months. 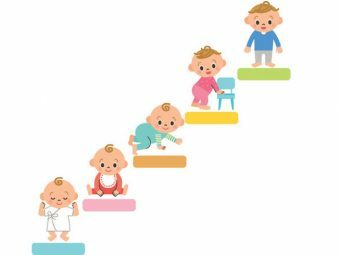 Each baby is different and could take more time than other babies his age to achieve a milestone. While a bit of delay is normal, you must take the baby to a doctor if the development is way too delayed. The US Centers for Disease Control and Prevention (CDC) recommends parents to be alert about these delays in a two-month-old’s growth. Does not hold head up when pushing up from tummy. Unable to support head when sitting with support. Does not bring hands to the mouth. Does not follow objects as they move. Never smiles and does not make cooing sounds. Does not turn head towards sounds around. Take the baby to a doctor for a checkup when you notice something amiss. The American Academy of Pediatrics (AAP) recommends screening infants at regular intervals to detect developmental delay and mitigate their effects (6). And, as parents, you can always work on helping your little one grow the healthy way. Have regular tummy time: Tummy time activity strengthens the core muscles while benefiting the infant’s neck and arm muscles. Pediatric experts recommend tummy time as an ideal way of stimulating a baby’s physical growth (7). Have at least three sessions of tummy time in a day with each session lasting five minutes. Play games that stimulate the senses: Encourage a baby to find a source of a sound or spot his parents from a distance. Such games involve an active use of senses thus helping their development. Set a daily routine for activities. Have adequate social interaction: The baby’s first social skills take shape now. Spend time in social play such as family interactions, which help the baby remember and recall faces. The right activities help a two-month-old hit the growth landmarks right on time. Remember not to be overly enthusiastic about the milestones; let the little fellow take time to comprehend the world. When you have a hunch that something is wrong, get a pediatrician’s appointment right away. If you know of any activities that stimulate the development of a two-month-old, then share them in the comments section below.